Sounds like a new Chevy. Hopefully the dealership will try and resolve the leaking issue. No leakage on our 2015. Hope you get it fixed before it gets lots of mold in there. My Mom's 2015 2-LTZ has a leak in the trunk too. I don't know where it's coming in but the taillights sounds plausible. My 2014 Impala 2LTZ, purchased new, was repaired under the satisfaction campaign/new car warranty for the leaking taillight gaskets. GM issued new design taillight gaskets. The repair involves removing the rear bumper fascia and taillamps. I suspect your only recourse is to return the car for warranty repair. It amazes me that GM / Chevrolet can't build a new car without a taillight gasket that doesn't leak water into the car. It makes me wonder what other shortcuts were taken with the vehicle and its design. Classic poor quality. Find a person on this forum called 1970cs. I just had my 2014 fixed for free but they scratched the bumper when they took it off. just wondering about the sound matting that you put in the trunk.......did it help with road noise? Also, did you cover the entire trunk or partial. If you have a pic, that would be cool. I see that I have been paged! Anyways I agree with the others that should have had the 3 revision tail lamp gaskets! Mine were put in summer of "14" after 2 1/2 weeks of tearing out everything, overnight mold growth, finally the GM engineers came with some sort of cocktail that finally killed the mold. They did cover a rental for the entire time. Due to the time it takes to drop the rear bumper and valance, I would let the dealer do it under warranty. It could be mis-formed metal or a missing gasket??? We also have new style 2014 Silverado that the daughter was wondering why the back seat was wet (good catch for a 13 year old) found out that the CHMSL was leaking water into the cab! I ended up pulling the lamp and cleaned the area up and used some household acrylic latex caulk on the gasket area and it has not showed any signs of leaking for the past 100 days. Thanks, yes I read about your trouble in the past post. I have no signs of mold and the carpet was damp after the rain not completely saturated. When I closed the trunk and ran the hose down the roof to the trunk for a few minutes and opened the trunk then I saw water standing in the spare tire well again. I did not use a lot of pressure with the hose and tried to simulate a heavy rain with the water. It was only wet on the drivers side under the tail light and looked liked it ran into the tire well from there. Everything else was dry, I had all the carpet out while testing so I could dry it out before and after. It does not sound as it is as bad as yours but thanks to this site and and people like you posting I could find out what to look for. I keep in in a garage and don't drive it much during the week (I drive a company car) there is no telling how long it would have gone until I had noticed it had not been fixed! It could have turned into a huge mold issue like you had. I am planning on getting it back to the dealer and pressing them on repairing now that I see where the problem is. I'm glade there are resources like this forum that we can turn to when problems arrise. I hope the pictures show up... Yes I do think the mat helped with the road noise a good bit. I noticed in my car that the all four doors were very quiet and most of the road noise that I heard was coming from the trunk area. 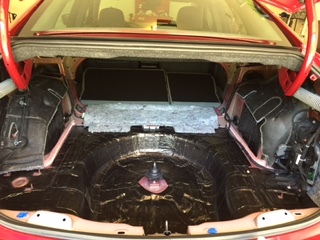 After I looked under the carpet I saw very little insulation between the carpet areas and the metal (I could have been missing some I purchased my car used but I asked a friend that had a 2014 and he reported the same as I had). I had never installed any of the mat before and read up on it and decided to buy the Noico Black 80 Mil Brand in black finish it had great reviews and was priced less than the others. I was not not looking for anything for a sound system or to stop rattles just to cut down on noise and to install under carpet and this brand had good reviews for that purpose. 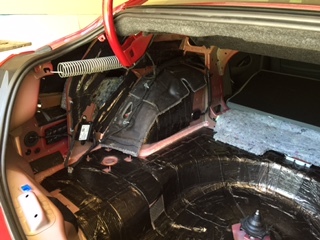 I removed all of the carpet from the trunk area and made sure that all the metal surfaces that I installed it to were clean and wiped down with de-greaser. Being that the car was almost new this was not a hard task everything was basically clean. I started with the bare metal behind the wheel wheels and installed there first then covered the wheel wheels. I removed the spare tire and covered the entire well. I then removed the styrofoam "storage Box" and installed it underneath it. I removed the plastic trim piece that is clipped on the rear above the Buber and installed the mat on about 80% of that. I tip that I read before installing that helped me out was to take paper patterns of areas first before then test fit before applying. Once the mat is down it is down, sticks like crazy. I also found that it was easier to do areas in 4 to 5 inch strips overlapping each one about 1/8". I purchased the mat roller and do not think that I could have completed the job without it. You basically apply the mat, it has raised squares on the top side, you roll the squares flat and shape the mat into all the contours and move on to the next piece. I live in SC so the temp was in the hi 70's so I'm sure that helped it form into contours better, the instructions indicated that a heat gun or hair dryer could be used if needed. I would have made a mess If I had used one. Is the road noise completely gone, no. I can tell at hi way speeds that it has helped. It cost me about 60.00 for the whole install and about 4 or 5 hours of my time. I asked my dealer before I installed the mat if it would effect my warranty in anyway before I installed the mat and he told me it would not. I was very careful not to install the mat on any welded seams and made sure that I cut holes around all fasteners so that the mat would not come into contact with them. I glad I did it, if not...I probably would not have seen that my trunk was leaking. If memory serves mine was leaking pretty bad! My car wash towels were actually freezing from water that was wicking from the carpet. 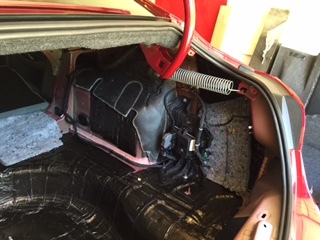 All carpet, rear seats and rear package tray were replaced under warranty. Hmmm. might have to do this.